This sometimes happens. A breathtaking talent sent from the stars to become a star among us. A supersonic arrival delivered to shake us up and make us wonder if, indeed, reincarnation exists. Because this child, this actor, this wonder landed on our movie screens full to the brim with something to say and the instrument to say it. As if she'd burned up the stages of Europe in another era and wasn't finished. As if she demanded an encore and, five years after being (re)born in Houma, Louisiana, shouted, "I'm ready. Bring it on. I'm taking on the Western hemisphere." 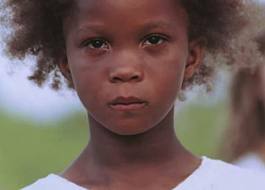 Quvenzhané Wallis is the star of Benh Zeitlin's visual jewel BEASTS OF THE SOUTHERN WILD. It is inconceivable to imagine the film without her. 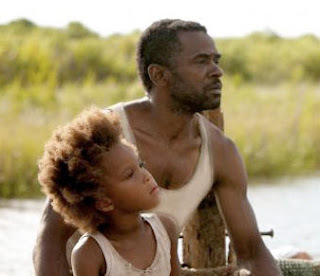 This is not to say she's not surrounded by talent — to be sure she is, most notably in a performance by Dwight Henry as her father — but it's this child's ferocity and immediacy that hold each frame in place and hold our hearts tight. In an interview, Henry claims she would give him direction on the set. "Do it this way," she would say, then show him. In an even slightly older actor such behavior would be conduct unbecoming, but from a tiny girl one can forgive and be amazed. I'm ambivalent about Wallis receiving an Oscar nomination. On the one hand, of course she deserves the honor and the red-carpet attention for her work. On the other hand, I fear for her future in the hands of Hollywood handlers. 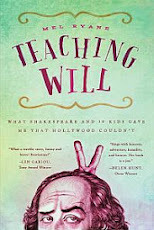 This gifted actor was born for center stage with qualities that are unteachable. It's impossible to teach an actor to have an emotional instrument. It's there or it isn't. It's impossible to give an actor timing. It's there or...it isn't. However, these qualities in her are still unrefined. If this bundle of talent sets sail without developing her craft, it would be heartbreaking. And there's the rub. Hollywood is about profit. Wallis is now nine years old and a commodity. Hollywood managers, agents, directors, producers and studio heads tend to think, Don't damage the goods. There's an archaic view in the industry that raw ability will lose its punch or spontaneity in an acting class. This opinion is infuriating. First and foremost, because she'll need the armor of craft to see her through a career. There are too many working directors who don't actually understand what an actor does or is capable of doing because they've never studied the craft. She'll need to know how to play her instrument like the Stradivarius it is. She'll need technique to give her backbone, to hold her strong and steady in the heady clouds of the Hollywood Hills. I wish we could collectively embrace her in a blanket of protection. I hope she's being advised by one of the few smart ones in this town. I want her to fly as an actor for years and years, not just this year or next. 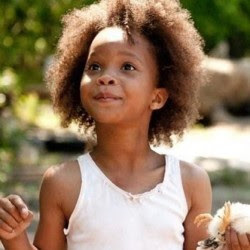 Quvenzhané Wallis is already gold. She doesn't need the statue. Not yet.